LOS ANGELES - Robert Goulet, the strikingly handsome singer with the rich baritone who soared to stardom on the Broadway stage in 1960 playing Lancelot in the original production of "Camelot," died yesterday at Cedars-Sinai Medical Center. A native of Lawrence, Mass., he was 73. Mr. Goulet, who recently had been diagnosed with interstitial pulmonary fibrosis, was awaiting a lung transplant, said Norm Johnson, a spokesman for the singer. The singer had fallen ill while flying home to Las Vegas after performing at a Sept. 20 concert in Syracuse, N.Y.
"Robert Goulet was a monumental presence on the stage and had one of the great voices of all time, which often overshadowed his many other talents," pianist Roger Williams said in a statement yesterday. "He really could do it all - act, dance, and was as funny as hell, especially when he was making fun of himself. Robert always took his craft seriously but never took himself seriously. Oh, how we will miss this great guy." Mr. Goulet had moved to Canada when he was a teenager and had been a popular singer on Canadian television when he auditioned for the role of the brave young knight in Lerner and Loewe's "Camelot," opposite Julie Andrews' Guinevere and Richard Burton's Arthur. In a review of the long-running hit musical, a Variety critic wrote that Mr. Goulet "has the looks and the speaking and singing voice of the ideal Lancelot." With his dark hair and blue eyes, Mr. Goulet was the personification of a Kennedy-era leading man. Judy Garland called him a living 8-by-10 glossy, and Truman Capote called him the "poinsettia of botany." Added to the matinee-idol looks was that distinctive singing voice, which Mr. Goulet's father considered a gift from God. Upon hearing Mr. Goulet sing "If Ever I Would Leave You" during the first day of rehearsals for "Camelot," Burton called it "the voice of an angel." "I was stunned by his performance," recalled Miles Kreuger, president of the Los Angeles-based Institute of the American Musical, who saw "Camelot" at a preview the night before it opened. 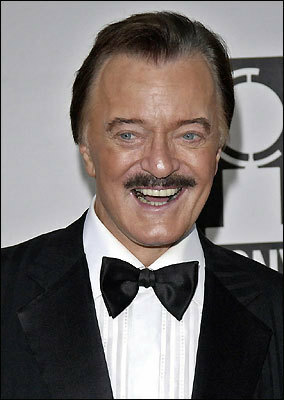 "At the time, before reviews were published, Robert Goulet was entirely unknown in New York," Kreuger said. "When he appeared early in the show to sing 'C'est Moi' and swept his huge cape with a glorious flourish, the entire audience, male and female, gasped at the presence of this striking young man with a powerful, beautifully modulated baritone." Mr. Goulet, who won a Grammy Award for Best New Artist in 1962, went on to win a Tony Award as best actor in a musical for his portrayal of Jacques Bonnard in Kander and Ebb's "The Happy Time" in 1968. During his 1960s and early 1970s heyday, Mr. Goulet turned out a string of hit record albums, appeared frequently on "The Ed Sullivan Show" and other popular television variety shows, and starred in his own TV specials, as well as TV productions of "Brigadoon," "Carousel," and "Kiss Me, Kate." Mr. Goulet segued into movies in 1962 when he and Garland provided the lead feline vocal characterizations for the animated film "Gay Purr-ee." He went on to star in several films, including the 1964 comedies "Honeymoon Hotel" (with Nancy Kwan) and "I'd Rather Be Rich" (with Sandra Dee). He also guest-starred on TV series such as "The Bell Telephone Hour" and "The Patty Duke Show" and starred in his own short-lived spy drama series, "Blue Light," in 1966. Mr. Goulet also sang at the White House for Presidents Johnson and Nixon and headlined in Las Vegas. He even earned a footnote in the saga of Elvis Presley: Mr. Goulet was performing on television when Elvis famously blasted his TV screen with a handgun. Mr. Goulet returned to the Broadway stage several times, including playing Arthur in a brief 1993 revival of "Camelot " and taking over the lead in a revival of the musical comedy "La Cage aux Folles" in 2005. The man who had hosted "The Bob Goulet Special Starring Robert Goulet" on TV in 1970 also continued to draw audiences to his concert performances. And he appeared in films such as "Atlantic City," "Scrooged," "Beetlejuice," "The Naked Gun 2 1/2: The Smell of Fear," and "Mr. Wrong." But the aging entertainment idol, who at one point began sporting a mustache, became something of a camp icon, whose old-school show-biz image made him ripe for satire on such TV shows as "Saturday Night Live" and "The Simpsons." Mr. Goulet didn't object and, in fact, periodically spoofed his Vegas persona, including appearing as himself in a series of wacky commercials in the 1990s to promote ESPN's college basketball schedule and, more recently, a goofy commercial spot for Emerald Nuts. "If you can't laugh at yourself, you're a fool," Mr. Goulet told the Orange County Register in 1996. "I don't like those who pat themselves on the back. My job is to entertain, not to go out there and be myself." Added Mr. Goulet: "I wish I knew the secret of my endurance. Perseverance, maybe. I want to be better than I sound. You can be tired or in pain, but you must perform for those people. You give it your best shot." Born Nov. 26, 1933, in Lawrence, Mr. Goulet grew up in the city's French-Canadian enclave (his father was born in Quebec, and his Maine-born mother also had family ties to Quebec). While growing up, Mr. Goulet told The Toronto Star in 2005, "I sang in the church choir, but I didn't think much of it. Then one night when I was 13, my [ailing] father called me to his bedside and said: 'Robert, God gave you a voice. You must sing.' He died later that night" of Hodgkin's disease. After his father's death, the Goulets moved to Alberta eventually settling on his grandfather's farm 200 miles north of Edmonton. By 16, Mr. Goulet was singing with the Edmonton Symphony. "I sang two songs with the Summer Pops and they gave me $25," he recalled. "I said, 'You get paid, too?' and that was the first time I thought there might be something in this after all." After graduating from high school, he spent two years as a disc jockey and announcer for an Edmonton radio station. After his appearance in a 1951 production of Handel's "Messiah" in Edmonton, he won a scholarship to the Royal Conservatory of Music in Toronto. Mr. Goulet was a popular regular on "Showtime," Canada's leading television variety program - he was dubbed "Canada's first matinee idol" and had a growing number of fan clubs - when he auditioned for "Camelot." He married Louise Longmore, with whom he had a daughter, Nicolette, in 1956. They were divorced in 1963, the same year Mr. Goulet married stage star Carol Lawrence. His marriage to Lawrence - with whom he had two sons, Christopher and Michael - has been described as tempestuous. They separated in 1976 and were divorced four years later. In her 1990 memoir "Carol Lawrence: The Backstage Story," she described briefly meeting Mr. Goulet for the first time backstage after seeing him in "Camelot." She was initially unimpressed, but once they got to know one another, she found him "funny, charming, and loving." After they were married, she discovered that Bobby, as she called him, also had a temper, extreme mood swings, and a serious drinking problem. Of the book, Mr. Goulet told The New York Times in 1993: "I've not read it, and I'm not going to read it." As for his drinking, he said: "I never was a run-down-in-the-gutter alcoholic. I never missed a performance." Then he sighed and said, "That's all in the past." In 1982, Mr. Goulet married Vera Novak, a writer and artist who began serving as his business manager and who, he said, helped get his life back in order. "She's an influence on me, and I love her dearly," he told the Toronto Star in 2005. Mr. Goulet, who underwent surgery for prostate cancer in 1993, began speaking candidly about the disease and the need for annual medical examinations. Earlier this year, Mr. Goulet performed at the Red Sox home opener at Fenway Park. As members of the 1967 pennant winning Sox team came onto the field, he sang "The Impossible Dream."